Save Time and Save Your Back While Moving Gear! The next time you move your heavy instruments and music equipment from home to the studio or gig, save a trip to the chiropractor and enlist the help of the RocknRoller Multi-Cart. This innovative equipment cart is like eight carts in one, as it can transform into eight different configurations to suit your gear. Need a flat cart to move gigantic synths in equally enormous flight cases? Need a vertical cart with handles for moving stuff up and down stairs? 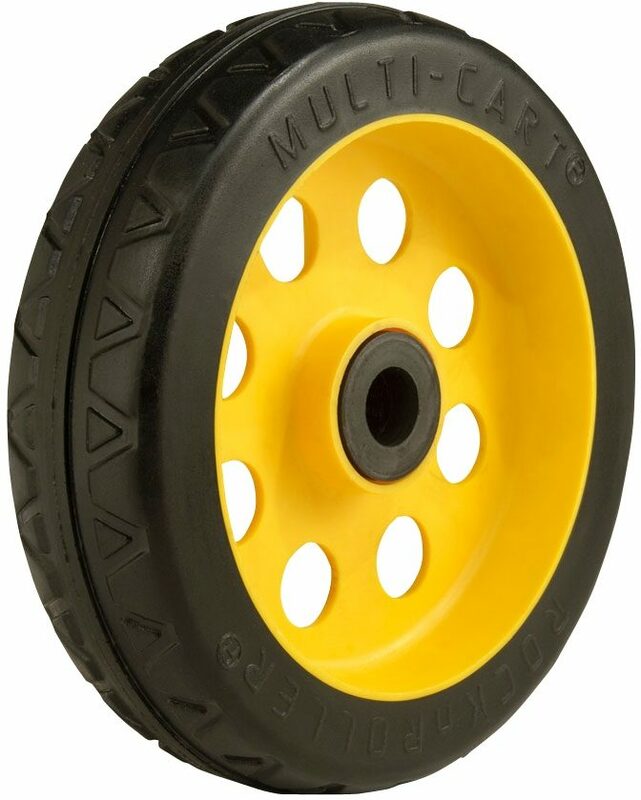 The rugged RocknRoller Multi-Cart is capable of handling these and any other transport situation. Equipped with R-Trac wheels and brakes, its lightweight construction makes it significantly lighter than other carts with traditional pneumatics or solid wheels, adding fewer pounds to your already heavy load. The RocknRoller folds up compactly for storage, taking up little space in your vehicle or garage. 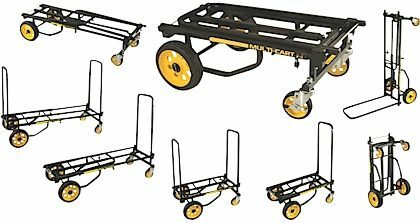 Unlike other carts, this "8-in-1" equipment transporter features R-Trac no-flat wheels designed to overcome the problems typically encountered with typical pneumatic, solid rubber, or urethane wheels. R-Trac wheels provide a pneumatic-like ride without the possibility of air leaks, ensuring a smooth ride for your expensive instruments and hardware. What's more, these wheels are up to 30 percent lighter in weight than traditional pneumatics or solid wheels, and they offer low rolling resistance, a high-strength polymer hub, and casters with lightweight brakes. All of these design features make the RocknRoller Multi-Cart lightweight and easy to maneuver. Powdercoated steel tube frame telescopes from 26 to 39 inches in length with 25-inch front/20-inch rear foldable sides. 6x1.5-inch R-Trac no-flat rear wheels and 4x1.0-inch front swivel casters with brake. Pre-drilled holes in foldable side to accommodate accessories. Load capacity: 350 pounds/25 cubic feet; weight: 15.4 pounds. Powdercoated steel tube frame telescopes from 28 to 42.5 inches in length with 24-inch foldable sides. 8x2-inch R-Trac no-flat rear wheels and 4x1.0-inch front swivel casters with brake. Pre-punched holes in foldable sides allow optional accessory attachments. Load capacity: 500 pounds/27 cubic feet; weight: 22 pounds. Powdercoated steel tube frame telescopes from 35 to 52 inches in length with 24-inch foldable sides. 8x2-inch R-Trac no-flat rear wheels and 5x1.25-inch front swivel casters with brake. Pre-punched holes in foldable sides allow optional accessory attachments. Load capacity: 500 pounds/32 cubic feet; weight: 27.7 pounds. Powdercoated steel tube frame telescopes from 35 to 52 inches in length with 24-inch foldable sides. 10x3-inch R-Trac no-flat rear wheels and 5x1.25-inch front swivel casters with brake. Pre-punched holes in foldable sides allow optional accessory attachments. Load capacity: 500 pounds/32 cubic feet; weight: 29 pounds. Powdercoated steel tube frame telescopes from 34 to 52 inches in length with 32-inch foldable sides. 10x3-inch R-Trac no-flat rear wheels and 8x2-inch patented R-Trac no-flat swivel casters with brakes. Pre-punched holes in foldable sides allow optional accessory attachments. Load capacity: 500 pounds/32 cubic feet; weight: 33 pounds. Powdercoated steel tube frame telescopes from 42 to 60 inches. 8x2-inch R-Trac no-flat rear wheels and 6x1.5-inch font swivel casters with brakes. Pre-punched holes in foldable sides allow optional accessory attachments. Load capacity: 700 pounds; weight: 36 pounds. zZounds is an authorized dealer of RocknRoller products. Weight 15.4 lbs 22 lbs 27.7 lbs 29 lbs 33 lbs. Rock N Roller Warranty ﻿Rock N Roller offers a warranty of one year on cart frames and 60 days on wheels and casters. 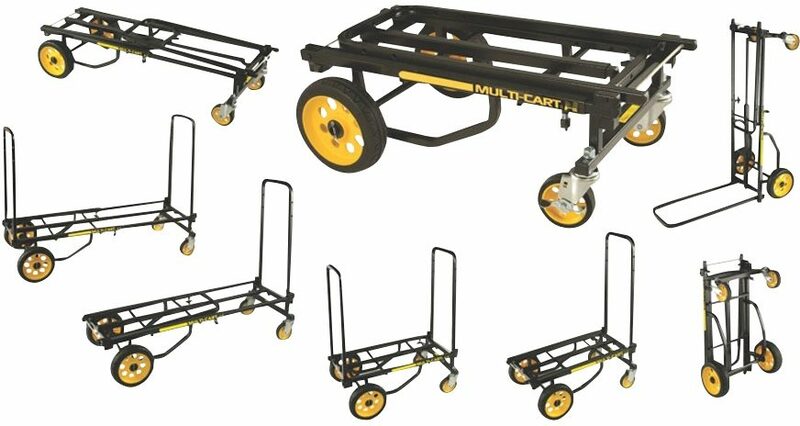 Now equipped with R-Trac wheels and brakes, the critically acclaimed RocknRoller Multi-Cart instantly transforms into any of eight configurations, replacing the need for eight different carts. It can carry huge loads, yet fold small for storage. The patented RocknRoller Multi-Carts are considered so innovative, they are even featured in college engineering textbooks for outstanding design. - R-Tracs reduce the overall weight of RocknRoller Multi-Cart making the critically acclaimed carts even more efficient and easier to manueuver. - Designed to work with vehicles, planes and trains. - Used by major TV networks, news crews, pro sports teams, Fortune 500 companies and thousands more. Powdercoated steel tube frame telescopes from 26-39 inches in length with 25 inch front /20 inch rear foldable sides. 6x1.50 inch R-Trac no-flat rear wheels and 4x1.0 inch front swivel casters with brake. Pre-drilled holes in foldable side to accommodate accessories. Load capacity: 350 lbs./ 25 cubic feet, weight: 15.4 lbs. Powdercoated steel tube frame telescopes from 28-42.5 inches in length with 24 inch foldable sides. 8x2 inch R-Trac no-flat rear wheels and 4x1.0 inch front swivel casters with brake. Pre-punched holes in foldable sides allow optional accessory attachments. Load capacity: 500 lbs./27 cubic feet, Weight: 22 lbs. Powdercoated steel tube frame telescopes from 35-52 inches in length with 24 inch foldable sides. 8x2 inch R-Trac no-flat rear wheels and 5x1.25 inch front swivel casters with brake. Pre-punched holes in foldable sides allow optional accessory attachments. Load capacity. : 500 lbs./32 cubic feet, weight: 27.7 lbs. Powdercoated steel tube frame telescopes from 35-52 inches in length with 24 inch foldable sides. 10x3 inch R-Trac no-flat rear wheels and 5x1.25 inch front swivel casters with brake. Pre-punched holes in foldable sides allow optional accessory attachments. Load capacity. : 500 lbs./32 cubic feet, weight: 29 lbs. Powdercoated steel tube frame telescopes from 34-52 inches in length with 32 inch foldable sides. 10x3 inch R-Trac no-flat rear wheels and 8x2 inch patented R-Trac no-flat swivel casters with brakes. Pre-punched holes in foldable sides allow optional accessory attachments. Load capacity. : 500 lbs./32 cubic feet, weight: 33 lbs. Powdercoated steel tube frame telescopes from 42-60 inches. 8x2 inch R-Trac no-flat rear wheels and 6x1.5 inch font swivel casters with brakes. Pre-punched holes in foldable sides allow optional accessory attachments. Load capacity: 700 lbs. Weight: 36 lbs. "Replaced My 15-Yr-Old Rock-n-Roller With a New R8RT! Love it!" Overall: I bought this Rock n Roller R8RT to replace my old Rock n Roller, which I bought when they first appeared in the music store, probably 15 years ago! I used it several times a week, until it finally wore out and wouldn't collapse any more! I am very pleased with how long it lasted and the amount of abuse it withstood! I am also pleased with the new R8RT. It is much lighter, and the new R-Trac wheels go over bumps easily. I was surprised at the variety of sizes and wheel choices on the new Rock n Rollers. I bought the R8 because it is the same size and wheel/caster type as my old cart. Big enough to lay my keyboard case on it, yet compact & light enough for me to lift and fit into my small van. If you regularly go over grass or bumpy tiles, and have room for it, I recommend getting the R10 or R12. However, based on the performance of my old cart, I expect my new R8RT to do the job for me. 23 of 24 people (95.83%) found this review helpful. Did you? "Must have for any dj"
Overall: A must have ...I should've bought this sooner. I can move 2 Technics 1200's, a rane sixty two all in their individual cases. 2 JBL Prx715's one Jbl Sub prx718 a 6 foot foldable table and a duffle bag with all wires in one trip with ease of course as long as there's no stair. All this equipment with just the R6. close [x]More ExpectedWe have been given a date of Apr 30 for the arrival of this item. This date is not guaranteed, rather an estimate based on either information obtained directly from the manufacturer or historical delivery data for the specific manufacturer.